Hello my name is Panda tots Stewart, I would like to enter the Pet of the Week Competition. 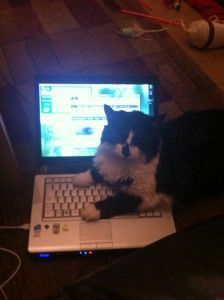 Who says animals cant use technology. Hope I am not too late. See my picture above. I am 4 years old, aiming to be slimmer of the year and working hard with my diet. I was 9kg but now 7kg. My hobbies are having lots of sleep on my mat, playing with my scratch post/toys and getting my harness on and going for a walk with my owner around the back garden.